Dan Jurgens has written, or co-written, some of the best Superman stories over the decades, and while "Booster Shot," isn't going to go down as one of them, it has proven to be an interesting follow up to "The Oz Effect," story line which featured a time displaced (and very much alive) Jor-El who attempted to destroy mankind because of their unworthiness, in his eyes. It was a story that relished in interesting and dynamic characterization, something that really isn't present in "Booster Shot." 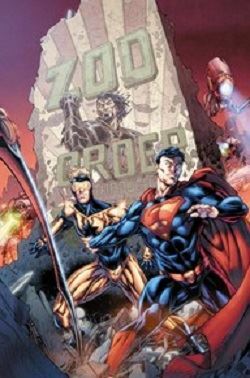 The current chapter, related here in Action Comics #997, features a Zod clan that is almost cartoonish in its depiction. They are so over the top in their spite and hate that they are almost parody. I've always enjoyed the more cold and calculating Zod as opposed to the spittle spewing hate monger. He and his hate oozing family look pretty good however in artist Brett Booth's capable hands, even if their facial expressions border on the cartoonish/parody as much as their words do. Superman and Booster looked pretty good as well, even if they were attached to an X shaped metallic cross for most of the issue. Booth drops in plenty of detail and kinetic energy into his panels. The whole effect results in a slight 1990s, early Image Comics style look. It's a nice fit with Jurgens' storytelling style though. The march to Action Comics #1000 continues, but Superman and Booster Gold, not to mention Lois and Jon, have some tight situations to get out of first in Action Comics #998.